The instant gratification that comes with planting perennials and annuals in an established garden can be immense. You can see how the plant you chose works well with pre-existing inhabitants. The color, the size, and the textures are some of the many things that need to be considered when designing. Unfortunately, one of the most valuable additions to any garden bed does not provide that instant gratification: bulbs. These little nuggets are packed full of life, waiting to escape at the first sign of spring and create something beautiful. Whether it is a patch of Hyacinthoides, a hillside of Narcissus, or dappled Crocus on the edge of the forest, each bulb planted will bring a bold pop of color to any landscape. The problem that some of us face year after year is, what bulbs to choose and where to plant them. Here are some of my favorites at the Scott Arboretum of Swarthmore College, along with some planting tips. When initially planting Narcissus (daffodils), clump the bulbs in masses so the first year is as impactful as the years to come. The bulbs will spread outward over time and begin to fill gaps. Daffodils can be found along Magill Walk in the spring. 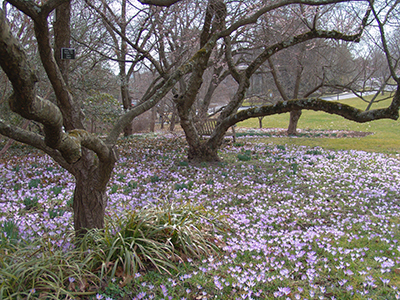 Plant a naturalizing bulb, such as Crocus tommasinianus, throughout warm-weather lawns. The turf will go dormant in the winter months turning a dull brown. 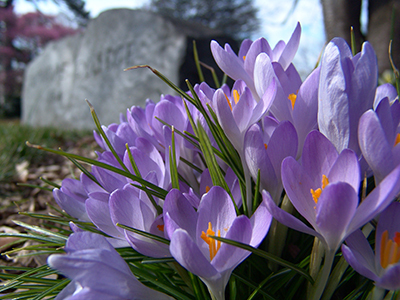 The early blooming crocus will brighten up that patch of lawn, becoming a sea of purples, greens, and whites in the spring. Seas of tommy crocus can be seen in the Cherry Border in March. Massing large Tulipas can create a dramatic effect, but planting smaller, intricate tulips sparcely throughout a low-growing bed can create a serene, pensive experience. 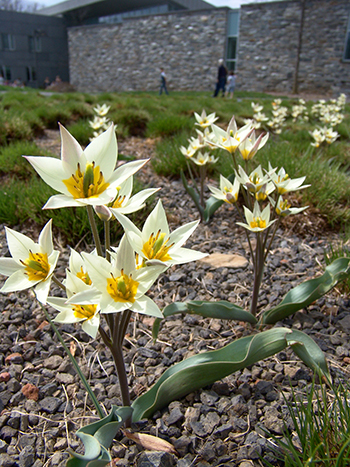 This effect is achieved with Tulipa turkestanica planted in an infiltration bed outside of the Science Center. Most tulips will not perennialize, so keeping an area in the garden open for these spring beauties to be planted every year is important to remember. It can be fun to completely change the feeling of an area with just one type of flower while also having the low commitment of an annual. You know spring is on its way when bright gold-yellow flowers perch themselves atop 2-3” stems. 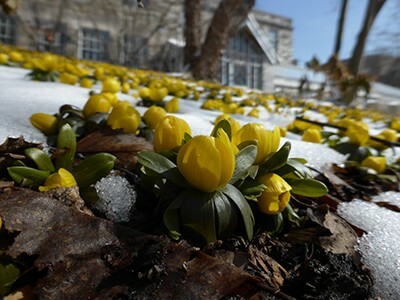 Try planting Eranthis hyemalis (winter aconite) bulbs this fall to help you welcome the new season. These bulbs will naturalize if they are happy, so be sure to plant them in their ideal growing conditions. Eranthis hyemalis enjoys lots of sun while blooming, but as the season progresses, shade is welcome. They want constant moisture throughout the summer and autumn, even though they are dormant by late spring. This will ensure your enjoyment of these little yellow flowers year after year. Masses of these can be found in early spring in the Terry Shane Teaching Garden, Winter Garden, Wister Garden, and the Scott Outdoor Amphitheater entrance. Each bulb will have specific instructions on location and depth to be planted, so make sure to do some research about what each particular bulb needs. Remember, when planting in the fall, there is more shade provided by leaf cover than there will be in the spring when the bulbs emerge. 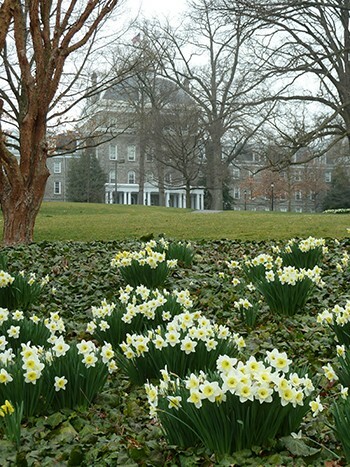 Attention paid to the initial planting results in better blooms in the spring. With that being said, I know that I have planted tons of bulbs completely incorrectly, and they still brought a wonderful show the following year. 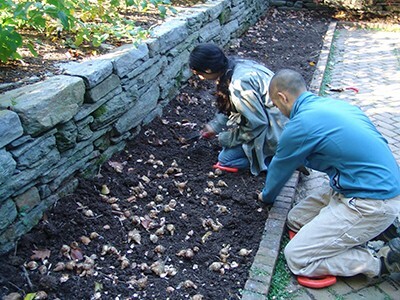 Planting bulbs is exciting, quick, and easy. The beauties can bring out the designer in any gardener.